FC Barcelona’s week of poor results as they stretched their winless run to three league matches in a week. 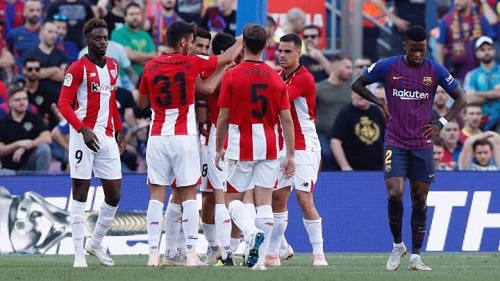 Following a draw to Girona and a loss to Leganes, Barça continued their poor form by dropping points at home to Athletic in a 1-1 match. Lionel Messi and Sergio Busquets were dropped from the starting eleven and although the Blaugrana were the better side, it was Athletic that struck first when Oscar De Marcos scored five minutes from the break. The second half saw Busquets, Messi and Munir come in and the latter two were involved in the equalizer. With six minutes to go, Messi squared the ball to Munir, who was standing at the mouth of the goal, and Munir scored with his first touch to volley the equalizer in. Hopefully Barça can return to their winning ways when they travel to London to face Tottenham Hotspur on Wednesday for their second Champions League group stage match. FC Barcelona: Ter Stegen, Semedo, Piqué (c), Lenglet, Jordi Alba, Sergi Roberto (Busquets, min. 50), Rakitic, Arturo Vidal (Messi, min. 55), Dembélé (Munir, min. 80), Coutinho & Luis Suárez. Athletic Club Bilbao: Unai Simon, De Marcos, Yeray, Iñigo Martínez (Nolaskoain, min. 23), Balenziaga, Raúl García, Dani García, Beñat (San José, min. 66), Susaeta (c), Yuri & Williams (Aduriz, min. 77). Goals: 0-1, De Marcos (min. 40); 1-1, Munir (min. 84). Cautions: Yeray (min. 47), Rakitic (min. 77), Busquets (min. 88), Dani García (min. 89), Nolaskoain (min. 89) & Messi (90+3). Previous PostBarça fall to Leganés 2-1 for first league defeat. Next PostBarça end winless streak with 4-2 victory over Spurs.